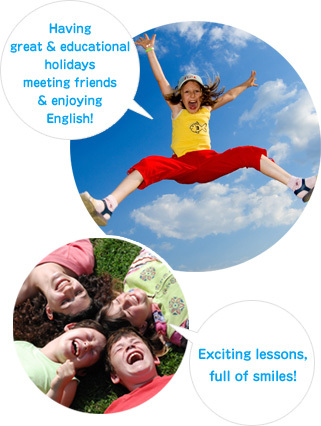 Enjoy English everyday for 1 – 2 weeks during your Spring and Summer holidays!! During their long term Spring and Summer holidays, students from ages 3 up to elementary school (at some schools up to junior high school), can experience one of our many international Preschool curriculums, which are totally different from those conventional Japanese kindergartens offer. The starting date of each, Spring and Summer School will be announced on the schools homepages once decided. It’s our goal to teach natural English while studying a variety of subjects / topics in English. We offer 1 week (about 15 hours) to 2 weeks (about 30 ? 48 hours) of English programs and give students the chance to spend their long term vacations having fun and learning English at the same time. This is a great opportunity for kids / students who are busy with activities at their regular schools. During spring and autumn terms they have a chance to spend lots of time in English speaking environments. With conventional English lessons, students usually learn English once a week, hence just 16 hours in four months! In our intensive programs, kids have the chance to improve their English skill more easily by spending a part of every day in an English speaking environment. You will also cut down on long commuting times and transportation and parking fees allowing for a more effective use of your time and money. Kids can make new friends in a new environment where (only) English is used as communicating tool. We offer tuition discounts for two or more siblings attending our programs / courses. Between terms our schools hold events such as BBQ’s to refresh our students and teachers. Making new friends using English!